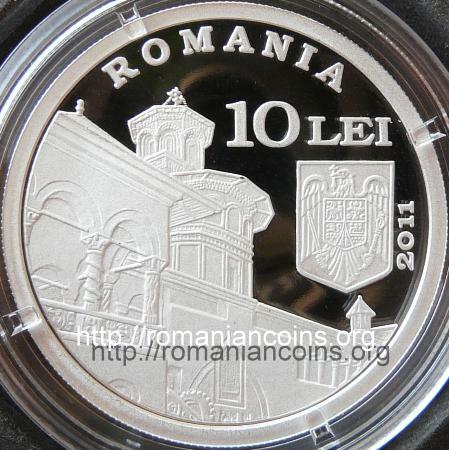 Obverse: ROMANIA, coat of arms of Romania, year 2011, face value 10 LEI, the church of Strei Reverse: another view of the church of Strei, inscriptions "BISERICA STREI" and "MONUMENTE DE ARTA MEDIEVALA CRESTINA" meaning "STREI CHURCH" and "CHRISTIAN FEUDAL ART MONUMENTS"
Obverse: ROMANIA, coat of arms of Romania, face value 10 LEI, year 2011, the tower of Humor Monastery, the church of the monastery Reverse: another view of the church of Humor Monastery, inscriptions "MANASTIREA HUMOR" and "MONUMENTE DE ARTA MEDIEVALA CRESTINA" meaning "HUMOR MONMASTERY" and "CHRISTIAN FEUDAL ART MONUMENTS"
Obverse: ROMANIA, face value 10 LEI, coat of arms of Romania, year 2011, the loggia of Dionisie and the chapel of Hurezi Monastery Reverse: an image of the larger church of Hurezi Monastery, inscriptions "MANASTIREA HUREZI" and "MONUMENTE DE ARTA MEDIEVALA CRESTINA" meaning "HUREZI MONASTERY" and "CHRISTIAN FEUDAL ART MONUMENTS"
These three coins belong to the Christian Feudal Art Monuments series. 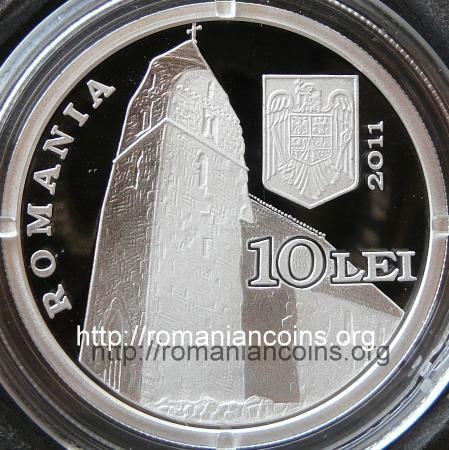 To the same series belong the 500 lei from 2002 gold coins with Bistriţa Monastery (from Moldavia), Mogoşoaia Palace and with Colţea Church, another two silver coins of 500 lei issued in 2004 bearing the images of the Three Hierarchs church in Iaşi and of the Cotroceni church in Bucharest, one silver coin of 5 lei issued in 2006 with the wooden church of Ieud-Deal, three silver coins of 10 lei issued in 2008 with the monasteries of Cozia, Voroneţ and Sîmbăta de Sus and the 10 lei 2013 silver coin with the wooden church of Rogoz. 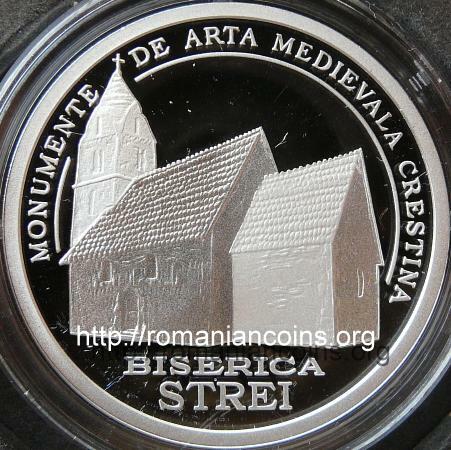 The church of Strei is one of the first medieval Romanian churches built in stone. It was erected during the last years of the 13th century, on the land of a Roman villa rustica - the church walls include stones from old Roman buildings. The church was dedicated to the Dormition of Virgin Mary, and was mentioned for the first time inside a document from 1392. The inside paintings were made in the 14th century by a painter named Grozie. In Haţeg and Hunedoara there are several other churches built by Romanian noblemen from the region: the ones from Sîntă Maria Orlea, Gurasada, Densuş. The Strei village is in Hunedoara county, being placed not far from the city of Călan. 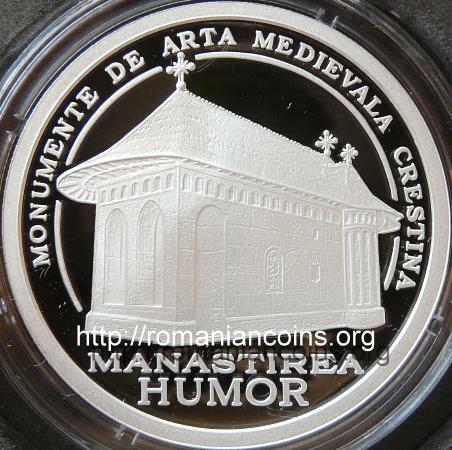 The Humor Monastery is placed in Suceava county, not far from the city of Gura Humorului. It is a very old monastery, being mentioned inside a diploma dating from the times of Alexander the Good. The monastery was built by vornic Ivan, and it is dedicated to the Dormition of Virgin Mary. The church of the monastery was rebuilt in 1530 by logofăt Toader Bubuiog (logothete) and his wife Anastasia, at the advice of voivod Petru Rareş - as the votive inscription proves. The church was adorned with frescoes on the inside and on the outside. We know the name of one of the painters: Toma from Suceava. In 1641 prince Vasile Lupu strengthened the walls of the enceinte and erected the defense tower. Following the occupation of Bucovina in 1775, the Austrians closed the monastery, in 1786. After 1990 Humor was reestablished as monastery for nuns. In 1473 Stephen the Great gave an evangel to the monastery. 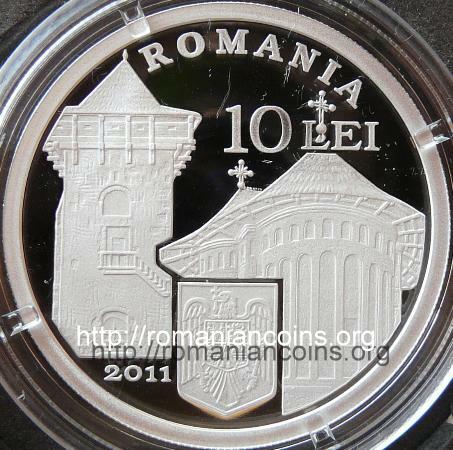 Inside this evangel there is one contemporary image of the great Moldavian voivod. The monastery is placed at the foot of the Căpăţînii Mountains, in Vîlcea county. Hurezi Monastery (sometimes named Hurez or Horezu) is the most important establishment of Constantin Brâncoveanu (ruler of Walachia between 1688 - 1714). The main buildings were erected between 1690 and 1697, but other buildings were added to the monastery until 1705. The patron saints of the main church of the monastery are Saint Constantine and Saint Helene. On an inside wall the entire family of Constantin Brâncoveanu was painted, with all his predecessors. The chapel was finished in 1697. It has an octagonal tower with eight windows, and it was painted in fresco by painters Preda and Marin. The loggia named "of abbot Dionisie Bălăcescu" was built in 1753 by stonemason Iosif. Each stone pillar of the loggia is carved with different motifs. The stone stairway that grants access to the loggia is also masterfully adorned with carvings. 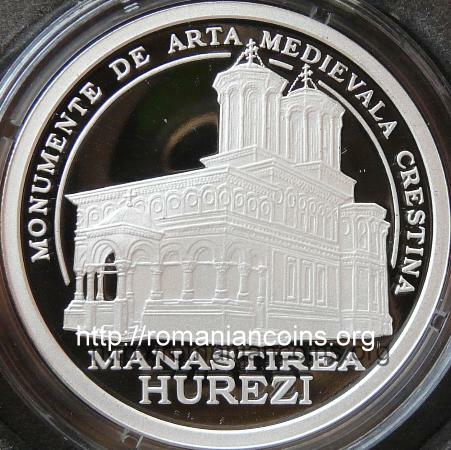 In 1872 Hurezi become, from a monk monastery, monastery for nuns.